As of October 1, 2010, all of these items are sold out. Click here for more affordable, eco-friendly seating options that are currently available. As you all well know, eco-friendly upholstered furniture can definitely lean toward the unaffordable for many people. While I would be willing to cut back and save up for an $8000 sofa that will likely last my family a lifetime (perhaps even several), I know that there are lots of readers who won’t, or can’t, do that. If you still want to go green, but not at so high a cost, here are some great sustainable furniture options. 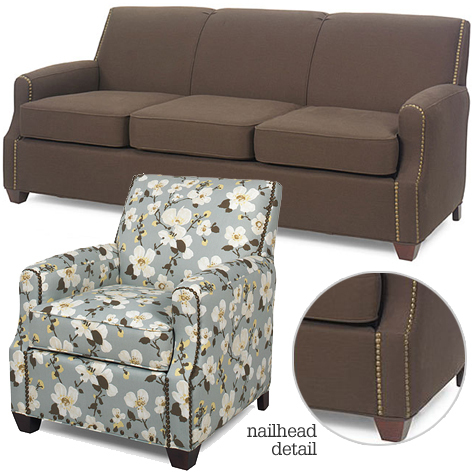 This sofa is the least expensive on the list and it is dripping with retro style. 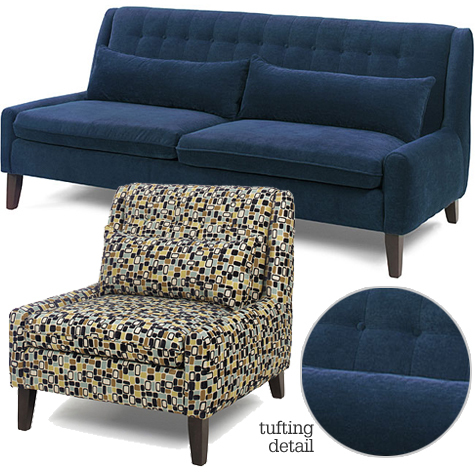 Covered in deep blue microfiber, it features a tufted back complete with covered buttons. I can envision it in a stark, minimal monochromatic room adorned with white pillows. It looks a bit like it would have been at home in a 70s-era basement family room with wood paneling behind it, but it has a lot more style. It would be great in a small apartment or room, because the armless style will make it feel less bulky. A matching armless chair is available for $599 . Why It’s Green: Made in the U.S. using sustainably harvested hardwoods, soy-based cushions and recycled steel springs and covered in microfiber that is Oeko-Tex 100 certified. This is a beautiful, classically-designed sofa that I have absolutely fallen in love with. From the taut cushions to the chocolate brown upholstery and gold nailhead detail, everything about this sofa screams “expensive” — except for the price. At just $1099, I’m honestly surprised that this sofa has as many green qualities as it does. 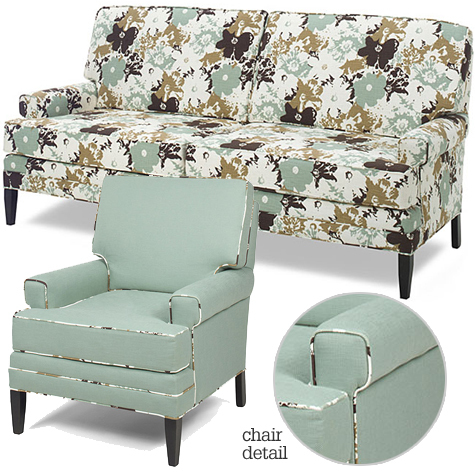 The matching chair in a complimentary, modern floral fabric (shown above) is available for $599 . 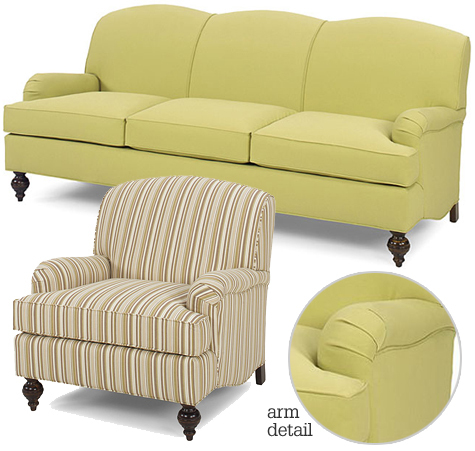 I love the subtle stripe featured on this elegant sofa with nailhead trim. It’s not exactly the ideal sofa for a family with young children, because I doubt the light color would stay that way for very long. But it would probably be great for a single person or childless couple, or for a family with older children. The style is very traditional, but I’ve always been a fan of mixing styles. With the right accessories, like some fun throw pillows, it could easily be used in a contemporary space. You can also get the matching loveseat for $999 and chair for $599 . I’m not sure if I personally like the lines or color of this sofa, but one thing is certain — it will definitely give your room a vibrant, unique vibe. It is a unique interpretation of a classic Charles of London sofa. Covered in chartreuse organic cotton, it features back cushions with a scalloped silhouette and spindly legs with a hand-carved look. It feels eclectic and bohemian, though the tailored pleats along the arms (which identify it as a Charles of London sofa) give it a sophisticated edge. This is a great price for a sofa that is as unique as you are. 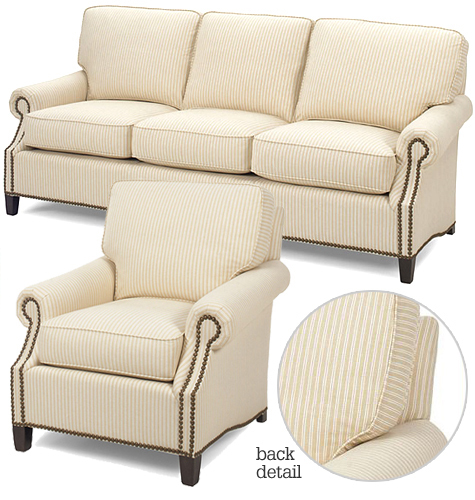 A matching chair in a neutral stripe is available for $649 . Why It’s Green: Made In North Carolina using sustainably harvested hardwoods, soy-based cushions and recycled steel springs. It is upholstered in 100% organic cotton canvas, and the fabric mill donates portion of each sale to The Nature Conservancy. If you love all things mid-century modern, this sofa will definitely appeal to your taste. The Captivia Everglades sofa features the clean lines and spindly legs that are so common in mid-century design, along with a vibrant floral pattern that will ensure it is the focal point of your room. You have to have an adventurous sense of style to be comfortable with a print quite this busy. The matching chair is available for $599 . Why It’s Green: Made In North Carolina using sustainably harvested hardwoods, soy-based cushions and recycled steel springs. It is upholstered in 100% organic cotton canvas, and the fabric mill donates portion of each sale to The Nature Conservancy. The manufacturer is also a member of the Sustainable Furnishings Council. I meant grow… that happens when you do ten things at the time. The lines of that reproduction “Charles of London” sofa are perfect for the house we’re renovating…I’d love to get rid of my pre-marriage/pre-kids leather sectional and get something with more classic lines that fits the scale of our new family room. Who makes this sofa? I’m in Georgia…having a really hard time finding eco-friendly furniture!! Thanks! I shop at Overstock and didn’t even think to check whether they carry eco-friendly products. Does anyone happen to know whether these contain fire retardant chemicals? I am looking for living room furniture with Hemp, Flax, Linen material and the cushions made of all natural latex. I found a website for a retailer in Portland, Or who carries furniture by Oz. I cannot find their website now. We live in Sacramento, CA . Please advise. Esther: I was looking around Overstock, everything seems very cheap and doubtful about the eco part. PS – The links to the above items are from Overstock. LOL! My bad. Make sure you check out the reviews deeper. I’ve been looking at items that have lots of good reviews and then when you dig, you read very poor ones. I have to believe that if you spend $1000 or less on a sofa, you get what you pay for, no? Good Luck! No need to apologize! That’s what customer reviews are for, right 🙂 These sofas are definitely affordable, but sometimes that means sacrificing some quality. I have had an EKLA sofa for about a year. It is very well made, EkLA has great fabric choices, and their cushions are wrapped in wool so that no flame retardant is necessary. Not sure if this is true about the above sofas. The above sofas also have soy “based” cushions meaning there are other materials used. Who knows what those are? As jennae writes, the EKLA sofa is as close to completely green as you are going to get (which would be sitting on the grass outside your house if you don’t use fertilizer or pesticides/herbicides and don’t have radon gas or other chemicals coming up through your soil, on a smog free day) . It cost more, but the latex filled cushions will outlast the soy foam. According to my understanding of fire retardant legal issues, all sofas for sale in the United States have to meet a strict standard, and will have to have layers of chemical fire-retardant materials, unless the company uses wool for the fire retardant layer. A sofa can be ecologically harvested, and have “soy-based foam,” but that foam may be soaked with chemical retardants that are toxic and unhealthy for many people. Pottery Barn would not tell me the chemical composition of their fire-retardants. Their salesperson said it is a “trade secret.” Crate and Barrel did disclose theirs — a representative kindly researched it and called me back a few weeks after my inquiry — and gave me the names of the numerous chemicals that are inside their soy-based foam. I appreciated the accurate information, but I do not want to breathe in any of those chemicals. I have given away all my toxic sofas, and now am looking for an organic wool upholstered one, which is the only kind that is both natural and legal to offer for sale, under the existing fire-retardant code in the U.S. A. I think we need new standards for labeling products in this country, a full disclosure of all ingredients, chemicals, and treatments clearly labeled in all consumer products, so we can make a choice. Marie, thank you so much for the additional information. There are so many components that go into products like this that it can be a real challenge to find products that go all the way. These ones from Overstock are certainly middle of the road in terms of being green, and their affordability comes with a price — that there are components that aren’t so green. Viesso: http://viesso.com is a great company that offers wool upholstery, along with several of the other companies I referenced in a previous comment. I’d love to hear what you end up buying! THANK YOU! Finally someone really addressing the issues regarding ECO. I am sooooo tired of listings like this one that post eco friendly furniture because the wood is sustainable and something else might be recycled. And, SOY! soy foam is 10-20% of the polyfoam cushion which isn’t eco AT ALL. I’m all for sustainable but I think when someone wants a ‘green’ or ‘eco’ sofa we want a safe and human/world friendly. I want to breathe good air! Sorry for the rant, just so frustrated by so many lame post on “eco” sofas. There are definitely eco-friendly sofas out there that go a long way in terms of sustainability. They don’t contain flame retardants or poly foam, are made with sustainable fabrics, recycled parts, reclaimed or FSC-certified wood frames, etc. But you’re going to pay for them. The way I see it, the more consumers demand products that go all the way, the more products will appear on the market for better prices. Absolutely, the flame retardants and chemicals are unhealthy. That’s the reason Californians have the most PBDE’s in their bloodstreams causing health and fertility problems. Hey, does anybody care? What about you Jerry Brown? Thank you! I really appreciate this information. 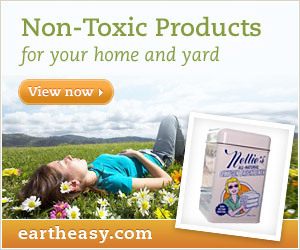 Sustainability is important, but for personal health the toxin-free materials, all natural, are the most crucial. Thank you. I realize also that fire-retardants can save lives. And everyone can’t afford to get wool for a natural fire-retardant layer. However, when I sit on a sofa or lie on a mattress that contains the modern chemical fire retardants, I literally break out in hives. When I go to furniture stores, I get sick (throwing up and worse) violently. It took me years to isolate the culprit — and it is furniture. I found a totally organic sofa from a company named Natura (they have many types of mattresses, but one line is called “Organic” and it has changed my life. Now I am searching for a similar sofa from a reliable company. I have written to Ekla Home, thanks to your recommendation, and when they reply, I will let you know what they say. Oops. I meant to say: I found a totally organic MATTRESS from a company named Natura…. Sorry. Marie. Here’s a photo of new eco sofa daybed that Organic Comfort Zone will be launching soon. It looks really nice. I have a question! I just got the same response from Pottery Barn yet in addition they stated in each email (I was trying to get them to clarify) that they do not use chemical fire retardants on any of their products other than their children’s sleepwear (don’t get me started on this one). How is this possible??? 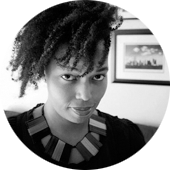 Thanks for all of the inspiring posts you write. The more we think green, the better our ideas will become! I thought only California had to have the flame retardant in the sofas and mattresses ALL sold in USA had to have flame retardant (i have the mattress in a wool layer so its supposedly chemical free, there just arent any prices that are really doable for SOFAS!! I found one company that said it only treated its foam cores with halogenated phosphate esters but that seems toxic? not sure though? what do you all think? Come see me at my green online boutique http://www.vintagerenewal.com for Indie Furniture Redesigns. We can’t afford to purchase a new sofa, but the Chicago Tribune article on the dangers of flame retardants has me very concerned. I’m wondering if anyone knows of a company that sells slip covers that can prevent the toxic dust from escaping from foam cushions? Thanks!! There are many affordable sofa and chairs available in markets, you can easily find but you should remember that it should be good quality and fire retardant. I really really like this sofa and chair. They are both really amazing. The color scheme is fantastic and the detail on the chair is eye catching. The mint color is great. I wish I could have this in my house. This definitely gives me some inspiration. I really love the Zipper-stripe Biscuit sofa. Not that I am speaking ill of the furniture, but I feel like I have seen similar pieces in hotel rooms. The vertical line motif really looks fancy. Great looking combination. Love eco-friendly solutions. Eco friendly is the way to go now days. Stylish, affordable and environmentally friendly. This collection you put together is excellent. Appreciate you taking the time to find these. Good stuff! I’m very surprised that the zipper-stripe sofa is only just over $1,000. I’ve been wanting a light colored sofa like this one. I’ll have to hit a few furniture stores in my area to see if I can find anything like it! your post is so inspiring, usually we just focusing on model and price only, and far away from “eco-friendly” thing. Montego Navy Pennyback Sofa just looks awesome at all, so stylish and comfortable. Hi, It would be great if you use white fabric for a sofa that can reflect heat and reduce heating in living room for environmentally friendly. Thanks. Looking at these pieces of furniture, you would never think that they were made of things like recycled steel springs, and soy based cushions. I’m even more surprised that these eco-friendly furniture options are affordable. Thanks for sharing! I’ll definitely be making more “green” furniture choices the next time I replace my furniture! You have a nice range of reasons to label certain options green, from responsibly harvested materials, to organic materials, to soy-based materials, to recycled pieces, and more. The fact that one of your sources donates as well is an added reason to use these and similar resources for eco-friendly furnishings.